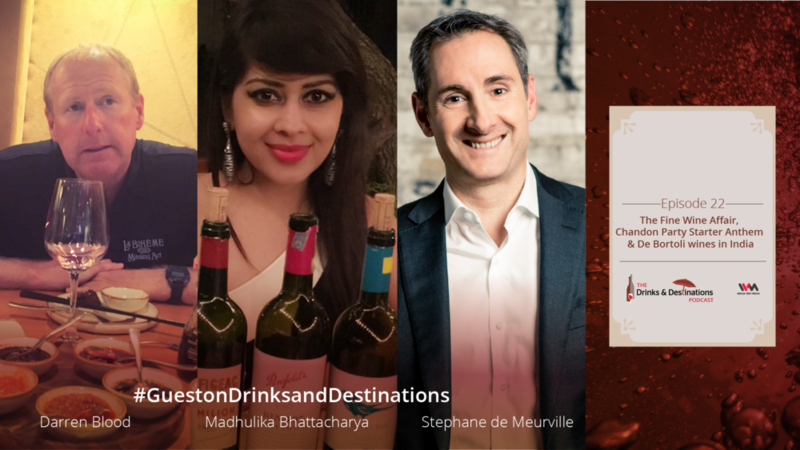 This week on The Drinks & Destinations podcast hosts Rojita & Sameera talk about lot of exciting events happening in the country: -Starting from Bangalore where the second edition of the event The Fine Wine Affair took place at The Oberoi Hotel and Madhulika Bhattacharya talks to us about it. -The sparkling wine company Chandon, Moet Hennessey India launched "The Party Starter Anthem" in collaboration with Bollywood actress Sonam Kapoor and singer Anushka Manchanda. - A chat with Darren Blood, the Export Manager, De Bortoli wines who is speaking about one of the De Bortoli wines 'The Noble One' once voted as the best dessert wine in the world. Sameera: "This was the launch of Chandon Party Starter Anthem which took place at Aer, Four Seasons Hotel, Mumbai and what were the highlights over there, Sonam Kapoor & Anushka Manchanda!!" Rojita: "Yes, it was so much fun. Thankully it was a beautiful evening when the event took place and just gets you into the party mode and it was the perfect place to host a party and an event like this. So this event was interesting as Chandon has been working on this concept for a very long time basically something that would get everyone in the groove of partying and associate Chandon as a brand whenever u party. "